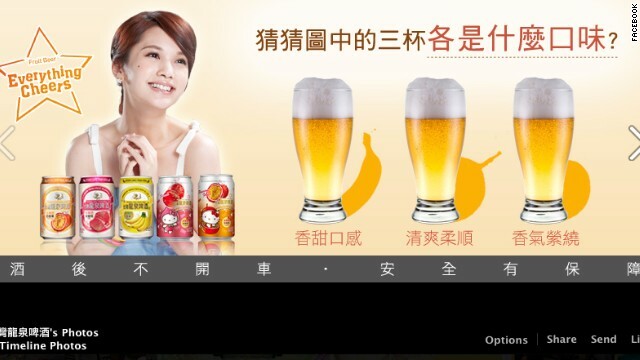 This Hello Kitty fruit-flavored beer from Taiwan is just one of many recent branding appearances for Sanrio's iconic cat. 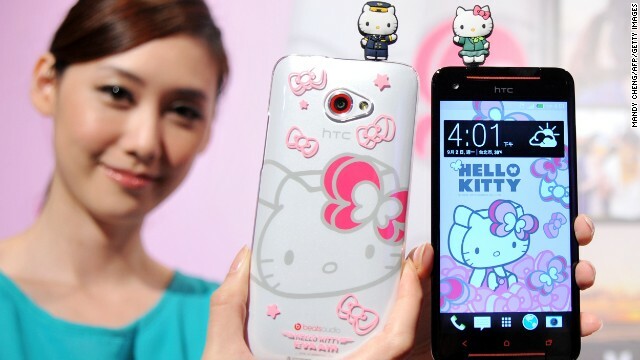 A model displays Taiwan electronics giant HTC's new smartphone "HTC Butterfly S Hello Kitty" with accessories during a press conference in Taipei on September 2, 2013. 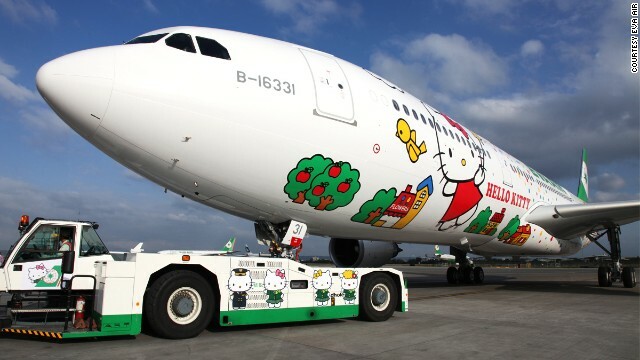 This is EVA Air's Magic Stars Hello Kitty jet, which flies from Taipei to various Asian hubs including Hong Kong and Japan. 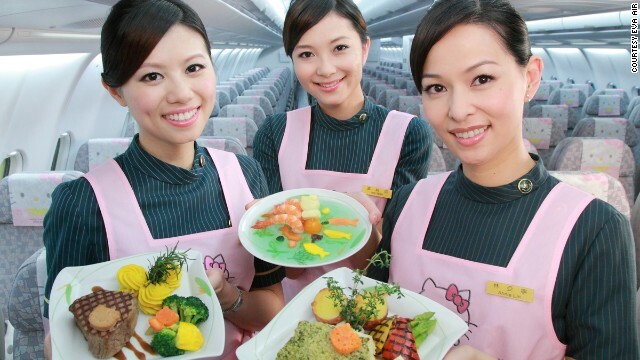 Flight attendants aboard EVA Air's Magic Stars Hello Kitty jet. A Hello Kitty doll poses with dishes at the Hello Kitty Kitchen and Dining restaurant in Taipei on July 11, 2013. 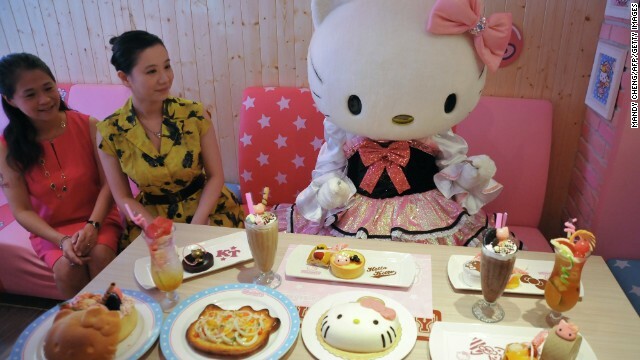 The only Taiwan Hello Kitty restaurant reopened after a month of renovations. 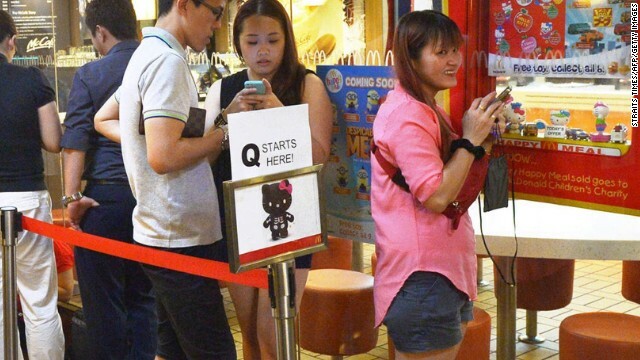 People wait in line to purchase a Hello Kitty toy in a skeleton outfit at a McDonald's restaurant in Singapore. Tempers flared and police had to be called in on June 27 as anxious Singaporeans rushed to McDonald's outlets to buy Hello Kitty plush toys being sold by the chain as a promotion. 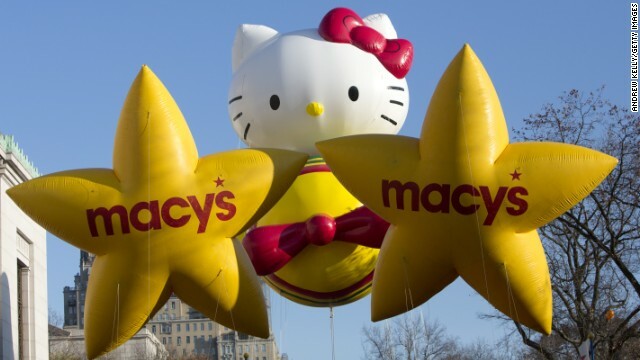 Hello Kitty flies high in the 2012 Macy's Thanksgiving Day Parade. Hello Kitty booth at the 2013 International CES at the Las Vegas Convention Center on January 8, 2013 in Las Vegas, Nevada. 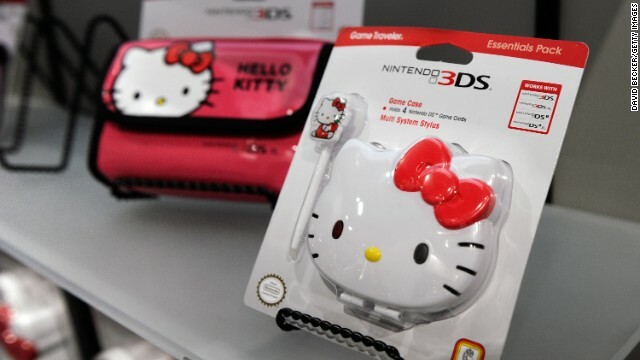 Hello Kitty branded video game cases are seen at the R.D.S. booth at the 2013 International CES at the Las Vegas Convention Center on January 9, 2013 in Las Vegas, Nevada. 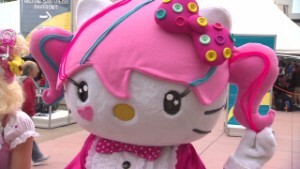 Hong Kong (CNN) -- Six simple words have sent Hello Kitty lovers into a spin. "Hello Kitty is not a cat." The apparently shocking revelation was made in an LA Times article published Wednesday about a retrospective of Kitty paraphernalia opening next month at the Japanese American National Museum. 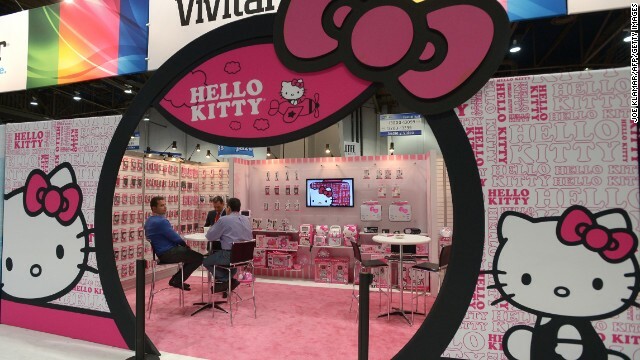 The story started innocently enough before the bombshell was dropped by Christine R. Yano, an anthropologist at the University of Hawaii, who has delved more deeply than most into the Hello Kitty phenomenon. Goodbye 'Kitty,' hello ... kid? "That's one correction Sanrio made for my script for the show," Yano told the LA Times. "Hello Kitty is not a cat. She's a cartoon character. She is a little girl. She is a friend. But she is not a cat. She's never depicted on all fours. She walks and sits like a two-legged creature. She does have a pet cat of her own, however, and it's called Charmmy Kitty." The news reached far and wide, including backstage after the Linkin Park gig at the Minnesota State Fair. I just got off stage to find out that Hello Kitty is not a cat. This is worse than finding out Pluto is not a planet. "I just got off stage to find out that Hello Kitty is not a cat. This is worse than finding out Pluto is not a planet," tweeted clearly shocked rapper Mike Shinoda. For those who don't know, Hello Kitty is an international superstar who was introduced to the world in 1974 by Japanese company Sanrio. In the last 40 years her button nose has appeared on a dazzling array of merchandise, generating billions of dollars for the company. Until now, her pointy ears and whiskers gave her legion of fans the distinct impression she was feline. She is a little girl. She is a friend. But she is not a cat. Summing up the disbelief, @jkltoraay tweeted: "You cannot say hello kitty is not a cat after 40 years no human has whiskers and pointed ears and a little yellow nose." For some, the news raised more questions than it answered. "Been tossing and turning for the last few hours trying to figure out how Hello Kitty isn't a cat. How is it possible? What does it mean?" @NotKennyRogers tweeted. "Since Hello Kitty isn't a cat, wtf is My Melody?" tweeted @mrsunlawyer. Users raced to update Kitty's Wikipedia entry, which now reads: "She bears the appearance of a white Japanese bobtail cat with a red bow although she is actually a little girl." IT'S OKAY HELLO KITTY FANS, KITTY PURRY IS A CAT. 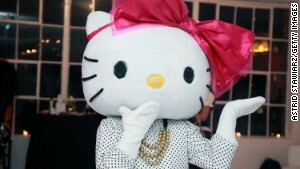 Singer Katy Perry stepped in to try to calm the masses: "IT'S OKAY HELLO KITTY FANS, KITTY PURRY IS A CAT." At last count it was retweeted more than 13,000 times. As the Sanrio website clearly states, Hello Kitty is a "cheerful and happy little girl ... who lives in London with her mama (Mary White), papa (George White), and her twin sister Mimmy." For the record, Kitty's birthday is November 1, she likes baking and making pancakes, origami and eating apple pie. Her favorite saying is "You can never have too many friends." She may have lost a few today.